Info Fill the hole with the dirt in your truck! Down in the Dumps is one of Jimmy T.'s microgames in WarioWare: Twisted! The name comes from the idiom "down in the dumps," which describes someone who is unhappy. The player will control a truck. The game's objective is to fill a hole with dirt. To do so, the player has to use the Game Boy Advance's tilting ability to unload the truck. If done so, the game is won. 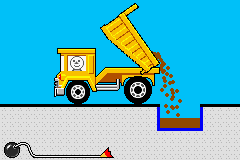 However, if the hole isn't full or the truck falls into the hole, the player loses the game. 1st level difficulty: There will be one truck. 2nd level difficulty: There will be two trucks. 3rd level difficulty: A large truck is backing up toward the hole. As soon as the tank is moved by the tiniest amount, the truck stops, so it is the player's mission to stop it when the back wheels are right in front of the hole. Stop it too early, and all the dirt will pour out onto the ground. Wait too long, and the truck will fall into the hole. This page was last edited on November 17, 2018, at 03:30.